User Acceptance License Agreement within the App Store. Together these documents form your agreement ("Agreement") with us. It is important that you read all of the documents forming your Agreement carefully since they contain important information about your Shop Appi Membership, including your rights and obligations. Please save/print a copy of your documents and keep them together and in a safe place in case you need to refer to them in future. Your Shop Appi Agreement is made between: You ("you" or "Member"); and Webloyalty International SARL Company SA, 23 route de Crassier (Business Park Terre Bonne, Bâtiment A3), 1262 Eysins Switzerland no CHE-344.043.246 ("WL, "us" or "we""). Payment of the Membership Fee or acceptance or use of the Webloyalty Membership Service and the receipt of any of the specific benefits will constitute the Member's acceptance of all of the terms and conditions of this Agreement. By entering into this Agreement with WL, you will become a Member of the Shop Appi Webloyalty Programme ("Webloyalty Programme"). Phone: 0800 023 2583 Monday through Friday 8AM - 8PM, Saturday 9AM - 4PM excluding bank holidays. Write to: Shop Appi Customer Service Department (Sentinel House, Airspeed Road, Portsmouth, Hampshire, PO3 5RF). Your correspondence will be re-directed to our Customer Service Representatives (operating from outside the UK). As a Member of the Webloyalty Programme WL grants you the right to: earn cash back up to a maximum of £250 each month on all Qualifying Purchases, and to earn, or receive other benefits. Collectively, the right to participate in the Webloyalty Programme and the right to earn and receive cash back and other benefits is referred to as the Webloyalty Membership Service ("Webloyalty Membership Service"). The specific benefits of the Webloyalty Membership Service are always subject to availability and change. The Member should check the Benefits section of the App or contact the Customer Service Team (see contact information above) in order to check whether a particular benefit is available at a given time. The App contains an estimated savings calculator within the Home search pages. This amount is an estimate only and is based on the list price of the item; however the actual monetary saving may not match the percentage. This is due to cash back being calculated as against the Item price only, it does not include tax, gift wrapping, shipping, promotional credits, returns, cancellations, transaction fees or other items specified on the Merchant's respective website. In order to receive the Webloyalty Membership Service and to qualify for any benefits associated with the Webloyalty Membership Service, Member must be 18 years or older and a resident of the United Kingdom. WL reserves the right, at its sole discretion, to refuse any person from becoming a Member. Members may join the Webloyalty Programme through a single enrolment and may not accumulate benefits and/or cashback premiums through multiple accounts. Members are expected to use the Webloyalty Programme in an honest and ethical way and in accordance with these Terms of Service. Any individual may only hold one Membership in a Webloyalty Programme at a time. Member agrees that the Webloyalty Membership Service may only be used for his/her own personal benefit. Membership of the Webloyalty Programme is not transferable. If a Member has more than one WL membership and/or a Member fails to comply with any provision of this Agreement, WL reserves the right to terminate all memberships and in such case any accrued benefits and/or cash back earned but not paid at the date of termination will be forfeited. Members must be human; no machines, scripts or automated services may be used to accumulate financial benefits derived from Membership and use of the Webloyalty Programme. Provided that the Member complies with the requirements set out in these Terms of Service, WL agrees to provide the Webloyalty Membership Service to the Member for the term of this Agreement. WL will endeavour to make the App available 24 hours a day, 7 days a week. However, there may be times when WL is unable to make the App available for technical, operational reasons, or for other commercial reasons. Any printed material and software provided by WL to the Member is the exclusive property of WL. To gain access to the App Members must have downloaded the App, have an email address, a user name and a password. Member agrees to keep Member's user name and password private so that they cannot be used by any other person. WL will not be liable for any damages, losses or expenses suffered by Member or any third party as a result of any unauthorised person gaining access to the users App on their device where WL is not at fault. We would like to draw your attention to the fact that, as part of the Webloyalty Membership Service, we may use the services of financial institutions or bank's subcontractors, subject to legal reporting requirements. In such circumstances these financial institutions or bank's subcontractors may carry out identity checks before any financial transaction is processed, including whenever we would process the payment of your benefits. Any information, which is processed by way of transfer to said financial institutions or bank's subcontractors, is intended for their use only and for this specified purpose only. As a result, we may ask you to provide us with a copy of your proof of identity (ID/passport) as well as some additional information such as date and place of birth, address and phone number. We inform you that your failure or refusal to provide the information requested will prevent us from providing the benefits of the membership and may result in the termination of your membership. There may also be some delay to us commencing delivering of your benefits to you as a result of these checks. Members shall be required to submit proof of purchase receipts to WL to receive some Membership benefits (see Section B for further details). Members may submit such proof of purchase receipts by filling out the required information in the provided forms within the App and copy pasting or providing an image confirmation receipt information. Any such proof of purchase receipt will be checked by WL for authenticity and eligibility, and must be legible. WL reserves the right at its sole discretion to reject any proof of purchase which is not clearly visible, has been tampered with, is damaged and/or does not relate to the purchase against which it is claimed. When sending materials to WL or otherwise communicating with WL, Members must not include any content which is defamatory, obscene, offensive, hateful or inflammatory, infringes any copyright, database right or trade mark of any other person, or is in any other way unlawful. Members of the Webloyalty Programme will have access to a website, www. shopappi.co.uk the purpose of the Website is to provide members with general information regarding the App, FAQs and the ability to contact Customer Services. The Membership fee (the "Membership Fee") as notified during the enrolment process and confirmed to Member in the Membership welcome email, will be charged on a monthly basis. Payment of the Membership Fee will entitle Member to continue his or her Membership of the Webloyalty Programme and to receive the Webloyalty Membership Service. The Membership Fee will be billed automatically to Member's designated payment vehicle, which may include credit or debit card (each a "Billing Device") unless the agreement is cancelled or terminated by Member or WL. WL may from time to time change the Membership Fee and will give you at least 30 days advance notice before doing so. In the event of any such change your attention is drawn to your general right of termination as set out below. During this Initial Period Member has the right to cancel the Agreement at any time up until 30 days from the start date of this Agreement without giving a reason or paying any Membership Fees (this Initial Period includes the legal right to cancel the Agreement at any time up until 14 days from the start date of this Agreement without giving a reason or paying any fees). If the user wishes to cancel the Agreement with Webloyalty, they must contact Customer Service either by phone, email or through the App or Website. iii. the membership was terminated earlier, in accordance with the Termination section. Directly within the Application using the electronic form - available in the 'Accounts Section' on the 'Contact' Page. Simply state within the electronic form that you wish to cancel the membership and the Customer Service team will process the request. To assist us in processing your request, please include your membership number in your request. By calling our Customer Service Representatives (operating from outside the UK) on the phone numbers set out in the page " Contact us" (Monday to Friday 8am-8pm, and Saturday 9am- 4pm). 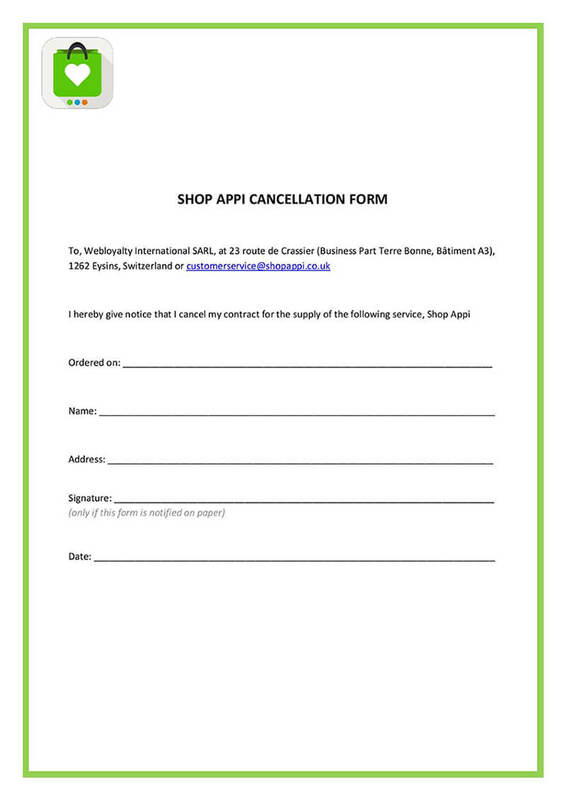 In writing you can either write to WL or download and send the cancellation form featured at the end of these Membership Terms and send this to: Shop Appi, Sentinel House, Airspeed Road, Portsmouth, Hampshire, P03 5RF (your correspondence will be redirected to our Customer Service Representatives (operating from outside the UK). A member wishing to terminate the Webloyalty Membership Service must notify WL by one of the methods set out [in the Contact section] above. Uninstalling or no longer using the App or switching mobile device will not automatically terminate the Membership and fees will continue to be taken. Uninstallation of the App and/or switching device will prevent WL from processing any cashback due to the Member and any accrued benefits and/or cashback earned but not paid may be forfeited. If no action is taken by the Member, the Membership shall continue. The Member simply needs to inform WL of their desire to discontinue their Membership with Webloyalty Membership Service to terminate their Membership and fees. WL has the right to terminate the membership of a Member at any time and for any reason on thirty (30) days written notice and in this case WL shall reimburse the member the Membership Fee for the monthly current period, prorated for the portion of the remaining period as the case may be. The Member shall immediately cease using or receiving all the benefits of the Webloyalty Membership Service as from the effective date of termination. The notification will be sent to the email address provided by the Member. WL will not be responsible for any non-receipt of notice by Member where such failure is caused by any reason outside the reasonable control of WL, including, but not limited to non-receipt due to; an error in your email address, an inaccurate email address, your failure to check your email online, your failure to inform WL of a change in your email address, a failure of the Internet, or your failure to check your Contact notifications within the App. WL also reserves the right to immediately terminate any membership for any misuse or fraudulent activity, any extraordinary activity which suggests fraudulent use beyond personal and domestic use of the Webloyalty Membership Service, for example and not exhaustively, including, if he subscribes several times to the Webloyalty Membership Service and terminates before the end of the trial period, thus benefiting from the service several times without paying a Membership Fee. Similarly, if a Member has made purchases for non-personal use or attempts to obtain benefits through the Webloyalty Membership Service for purchases made by another person or that s/he falsified supporting documents. Additionally, exceptional levels of cancelled orders and/or exceptional levels of returned Items may be deemed misuse and result in termination of your membership. In case of immediate termination of this Agreement at the request of WL, WL has the right to immediately suspend the payment of all accrued benefits without any right for the Member to reclaim them or any other compensation. WL may revise these Membership Terms of Service from time to time. WL will only make changes where we have a valid reason to do so. Where WL are able to do so, WL will notify you regarding any material changes to the Webloyalty Membership Services, your Agreement or the fees and will give you at least 30 days advance notice before making any such change. In the event of any such changes your attention is drawn to your general right of termination as set out above. WL will notify Member by email if revised Membership Terms of Service apply. Members are encouraged to read any revised Membership Terms of Service. Member acknowledges that while WL may be the provider of the Webloyalty Membership Service, the goods and services purchased ("Items") by Member through the App are provided directly by third party suppliers (each referred to as "Affiliated Merchants") to Member. Member acknowledges that, in such circumstances, WL has no control over the quality, safety or legality of Items advertised by Affiliated Merchants, the truth or accuracy of the listings or the ability of Affiliated Merchants to sell the Items and that orders placed by Members through use of the Webloyalty Membership Service and communicated to Affiliated Merchants are offers by Members to purchase Items from such Affiliated Merchants. WL cannot and does not control whether or not Affiliated Merchants will accept such offers or complete the sale of the Items they offer. With respect to Items provided by Affiliated Merchants, WL will have no liability to Member arising out of: (i) the failure of any participating Affiliated Merchants of any Items to supply any such Items on the terms offered; (ii) any delay in delivery of any Items, regardless of the cause of such delay, or (iii) any defective or non-conforming Items. WL makes no representation or warranty whatsoever, express or implied that Member's access to the App will be uninterrupted, timely, secure or error-free. WL agrees to take reasonable steps to prevent the introduction of viruses or other destructive materials. WL does not warrant, guarantee or make any representations that the App is entirely free of destructive material and WL excludes all liability in this respect unless (and to the extent) attributable to its breach or negligence. Except as expressly set out in Your Agreement, WL excludes all other promises to the extent that WL are legally allowed to exclude them. (Please refer to your local Citizen's Advice Bureau or local trading standards office for information about your statutory rights and promises which WL is not legally allowed to exclude). Member hereby authorises WL to deliver any and all communications ("Communications"), including but not limited to Membership information, procedures on use of the Webloyalty Membership Service, changes in the Webloyalty Membership Service benefits, and change in the Membership Fee to the Member's electronic mail address. Member agrees that s/he will not, for any reason, alter any Communication delivered electronically or otherwise. The details you supply will be stored securely and used by us to administer your Membership of the Webloyalty Programme. Information may be disclosed to Affiliated Merchants, regulatory bodies and/or your bank or card issuer and/or our subcontractors for the purposes of providing the Webloyalty Membership Service. We may disclose your information to the marketing partner that provided you with details of our offer to enable them to track the offer that you accepted from us and to enable them to undertake market research and data analysis in relation to but not limited to your shopping trends and behaviours. Information shared with the marketing partner may include name, address, email address, purchasing patterns and/or details on the status of your Membership of the Webloyalty Program, and will not be used for promotional or marketing purposes, and will not be disclosed by them to third parties, other than for the purposes stated above, who have undertaken in a binding agreement to process and maintain the confidentiality of your data in line with applicable law. These details will not be kept for longer than necessary. You are entitled to a copy of all of the information held about you for which we may charge you £10. Your data may be disclosed to third parties where required by law or in the event that we merge with or are bought by another company, or otherwise undergo a corporate restructuring. For more information about our data processing activities, please write to Shop Appi, 23 route de Crassier 'Business Park Terre Bonne, Bâtiment A3, 1262 Eysins Switzerland. Member acknowledges that use of any particular benefit may be subject to additional terms and conditions ("Benefit Specific Terms and Conditions"). This Agreement, including these Terms of Service, the Benefit Specific Terms and Conditions, Benefit Specific FAQs, and the App Store User Acceptance Licence constitute the entire understanding and Agreement of the parties with respect to the subject matter hereof and will supersede any and all prior oral or written communications, representations or agreements, other than with respect to the initial Membership Fee and membership term to which Member agreed at the time of his or her enrolment. Member must notify WL of any change to his/her address, electronic mail address and/or Billing Device. Customer Services Contact Information is set out above and can also be updated within the App in the Account Section. In addition, to ensure that cash back can be deposited in a timely fashion, Members must ensure that the bank & IBAN information they provide is accurate, and is the correct bank account of the Member. This Agreement will be governed by and construed in accordance with the laws of England and Wales. Member agrees to settle any disputes regarding Affiliated Merchant's Items directly with the applicable Affiliated Merchant and not involve WL in a dispute between Member and an Affiliated Merchant. The Webloyalty Membership Service is provided by Webloyalty International SARL Company no CHE-344.043.246, 23 route de Crassier (Business Park Terre Bonne, Bâtiment A3), 1262 Eysins, Switzerland. As a Member of the Webloyalty Programme, you are entitled to claim a Welcome Member Bonus ("Welcome Member Bonus"), in the form of a voucher or similar, which is offered to Members when they join the Webloyalty Programme. Details and conditions relating to the Welcome Member Bonus can be found via the 'Benefits' section of the App. This Welcome Member Bonus can be used within the app, or offline in any of our Affiliated Merchants. The same proof of purchase in the form of a sales confirmation receipt will be required regardless of method of purchase. The Welcome Member Bonus can only be claimed against purchased made by the Member after enrolment into the Webloyalty Programme. Members must claim the Welcome Member Bonus within three months of joining the Webloyalty Programme. After this three month period, the Welcome Member Bonus is no longer available. The Welcome Member Bonus may be claimed by Members even if they choose to cancel prior to the end of the three month period. To claim the Welcome Member Bonus simply send your sales confirmation receipt within 30 days of making your purchase. You can do this via the Saving feature within the Account facility on the App, which provides a form in which the Member can copy and paste the confirmation receipt they have received from the Affiliate Merchant. As a Member of the Webloyalty Programme, you are entitled to claim a monthly cashback benefit ("Monthly Reward") valid either towards an online purchase you make from the App or offline in any of our Affliliated Merchants. The same proof of purchase in the form of a sales confirmation receipt will be required regardless of method of purchase. You can claim your Monthly Reward once every month for as long as your Membership remains active. The Monthly Reward can be claimed against purchased made by the Member whilst the Membership is active. This Monthly Reward is not transferable. An index of the merchants offering cash back via the App ("Cash back Merchants") is provided within the App. WL is not responsible for changes to, or discontinuance of, any Cash back Merchant, or any Cash back Merchant's withdrawal from the Webloyalty Programme, or for any effect on accrual of cash back caused by such changes, discontinuance, or withdrawal. WL is not responsible for changes to, or discontinuance of any special offer or coupon code. It is the Member's responsibility to make sure that all special offers are valid. If you choose to use coupons and specials that are listed or are not listed on the Cash back Merchant landing page, WL cannot guarantee that you will be eligible to receive cash back on your purchases. Subject to the cash back limits set out in the Account Section of the App, you will be credited a minimum of 10% of the net purchases made by you at one of the Cash back Merchants as it relates to each Cash back Merchant. This is only available for products purchased through the App and does not apply to offline purchases. The net purchase is defined as the total amount paid to the Cash back Merchant minus tax, gift wrapping, shipping, promotional credits, returns, cancellations, and transaction fees or as the Cash back Merchant defines on their respective website. A) By accepting "Cookies" on our Merchant Partners' pages You will enable more accurate tracking of Your purchases. B) all potential Qualifying Purchases must begin in the App to ensure tracking of Your purchases. When you shop for a product, and complete your purchase,you will be redirected to the Cash back Merchant's website based upon that click. C) all potential Qualifying Purchases do not violate any Cash back Merchant specific terms set forth on the landing page of that Cash back Merchant. WL may, at all times, route your request for a Cash back Merchant website through specific links, in order to assure that the sale can be tracked correctly. Any alteration of these links will invalidate your purchase, which will not be deemed a Qualifying Purchase. There is a maximum eligible cash back amount ("Cash back Maximum") of two hundred and fifty pounds (£250) for all Qualifying Purchases in any calendar month during your Membership of the Webloyalty Programme. Any purchases you make from Cash back Merchants in a calendar month after reaching the Cash back Maximum shall not be deemed a Qualifying Purchase. Accrued cash back for Qualifying Purchases will be paid via a bank transfer to the bank account specified within your details in the 'Account' Section of the App. If no bank details have been provided, WL will retain such amounts until WL receive this information from you. Cash back is normally paid within 90 days of making a Qualifying Purchase; however, this period may be longer depending on the Cash back Merchant's validation processes. Cash back awarded to Members is subject to adjustments for returns, cancellations, and other events. WL may apply such adjustments to Members' accounts at any time as WL considers appropriate and at its sole discretion. It is your responsibility to check your account regularly to ensure that cash back has been properly credited and that your account balance is accurate. If you do not believe that a Qualifying Purchase has been correctly credited to your account, you must wait at least 30 days after completing a Qualifying Purchase to contact Customer Service. Furthermore, all cash back earned by Members are subject to review. WL may apply necessary adjustments to Members' accounts at any time. WL reserves the right to terminate any account for abusive or fraudulent activity. If you see that a Qualifying Purchase has not been recorded by the system after a 30 day period has passed, you can click on the 'Report Missing Purchase' button within the Account Section of the App to notify Customer Services. The form within the App, will ask you to send the confirmation receipt to the Customer Services team for review. If Customer Services require any additional information, they will contact you via the App, email or by telephone. If you place more than ten (10) orders or transactions from a single Cash back Merchant in any single calendar day, any Items contained in orders placed after the tenth order will not be deemed Qualifying Purchases. Except in circumstances where WL have acted negligently, WL will not be held responsible for changes made by Affiliated Merchants whether such changes relate to the discontinuance, removal, withdrawal of or interruption to all or any of the Affiliated Merchants services and whether or not such changes affect the payment of cash back. For the avoidance of doubt, only purchases made at Affiliated Merchants when available through the Webloyalty Membership Service will be eligible for cash back. It is your responsibility to keep your Membership account information current in order to facilitate the payment of your cash back. In the event that your information is not current at the time of payment, WL will retain such amounts until you provide valid bank details. Please review your details within the Account section of the App regularly to ensure they are up to date. No cash back earned or granted as part of the Webloyalty Programme, may be assigned or transferred to any third party except as expressly permitted by WL in writing and/or may be required by law. You authorise WL to disclose to third parties information you have provided, or information that WL has obtained about your account or shipping behaviour: (i) to agents of WL or its Cash back Merchants, such as independent auditors, consultants or lawyers; (ii) to comply with government agency or court orders or requests; (iii) in providing aggregated and non-personalised marketing services for an advertising or cash back Merchant partner, or (iv) where it is necessary for payments of your cash back. Further, you authorise WL to receive any account information from any Cash back Merchant including, but not limited to information regarding the Qualifying Purchase such as the products ordered, the order number, the time and date the Qualifying Purchase occurred, the email address entered for the Qualifying Purchase. You agree to hold the cash back Merchant harmless for any information. WL reserves the right to terminate the Cash back Rewards benefit at any time on thirty (30) days' notice. Notification of termination of Cash back Rewards will be sent to the email address you have provided to WL. WL will not be responsible for failing to notify you of termination of Cash back Rewards where such failure is caused by any reason outside the reasonable control of WL, including: an error in your email address, an inaccurate email address, your failure to check for your email online, your failure to inform WL of a change in your email address, a failure of the Internet or de-instillation of the application. Cash back Disputes: All questions or disputes regarding the Cash back Reward benefit including without limitation, questions or disputes regarding eligibility for the Cash back Reward, or the eligibility of discounts for accrual or redemption, must be submitted in writing to: Shop Appi, Sentinel House, Airspeed Road, Portsmouth, Hampshire, P03 5RF, or email us at cashback@shopappi.co.uk. Postal queries are collected in the UK and then forwarded to and handled by our Customer Service Representatives (operating from outside the UK). Nothing in these Terms and Conditions shall be construed as creating or constituting a partnership, joint venture or agency relationship between WL and the Cash back Merchants. The Cash back Merchants shall not have the ability to create any binding obligation on behalf of WL.